Slow cookers are counter top cooking appliances mainly used for simmering, for which relatively lower temperature needs to be maintained. It can be used to cook boiled dinners, stews, soup, pot roast other suitable dishes. Any basic slow cooker features an oval or round lidded cooking pot, which is made of porcelain or ceramic. It is surrounded by housing which contains electric heating element. Usually made of glass, the lid is placed in a groove in pot edge. A slow cooker is very much different from a pressure cooker; there is no risk or danger of abrupt pressure release with it. Best slow cookers make the most out of budget ingredients. Offers a low fat and healthier method of cooking. Crock-Pot, Hamilton Beach, Aroma, Proctor Silex, etc. 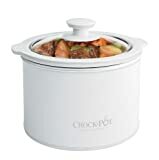 are amongst the brands offering top rated slow cookers. Choose one of these brands to get the best quality. Which ones are compatible with electric supplies in India? Can we use it in India or do we need to transformer?